Euro Hostel Pilsen is a modern, new-renovated hostel located in historical centre of Pilsen. You can have a good time during your stay in Pilsen no matter whether you come here on business or as a tourist. Euro hostel offers high-quality and cheap accommodation at reasonable prices with maximum capacities of 22 beds. There are private rooms with bathroom 3-7 bedded and dormbeds. All rooms have been renovated, are clean and spacious, equipped with colour TV-Sets, high-speed internet connection (Wi-Fi). There is a guarded parking lot at the disposal for the hostel guests. We are looking forward to your visit in our Pilsner Hostel ! Dormitories 5 - 7 beds in a room. Dormitories are segregated or in common. You pay for individual beds in this room, i.e. you share the room with other tourist. You are welcome to use lockers against a CZK 100 refundable deposit. You can also borrow a towel at the reception for CZK 50 (CZK 100 -refundable deposit). You can use a safe-deposit at the reception for your valuables as well. All rooms are equipped with: - a high speed LAN internet - a colour TV set - linen -bathroom with bath tub or shower The hostel further offers: - guarded parking lot - laundry - left-luggage room - breakfasts - reception services - restaurant Check-in is from 2 p.m. Check-out at 11 a.m. Reception in hostel (Hotel Roudna) is open 24 hours. It is neccessary to pay 100,-CZK deposit for the key (it will be given back to you when you return the key). Keys must be returned to Hotel Roudna untill 12:00 o'clock. In reception in Hotel Roudna you can sort out all problems you would have. You can pay for the secured car park ( 150,-CZK). We also offer buffet breakfast for 150,-CZK served in Hotel Roudna. If you wish to have breakfast, you can order breakfast and pay in advance on your arrival. 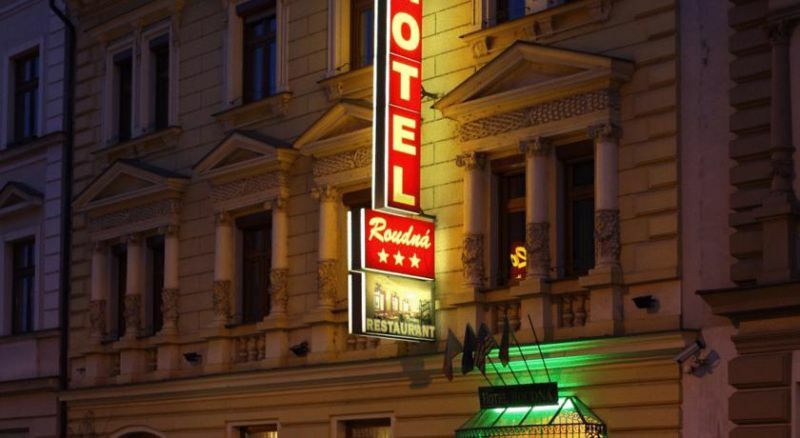 Hotel Roudna also offers laundry service - more information at reception desk. Na Roudné 13301 00 Plze?